Andy, our kitchen designer, needed to know how much space we're going to need in our living room for furniture, because we got talking about custom bookshelves and space is at a premium in every room of the house but especially there. So: Pete and I went shopping! 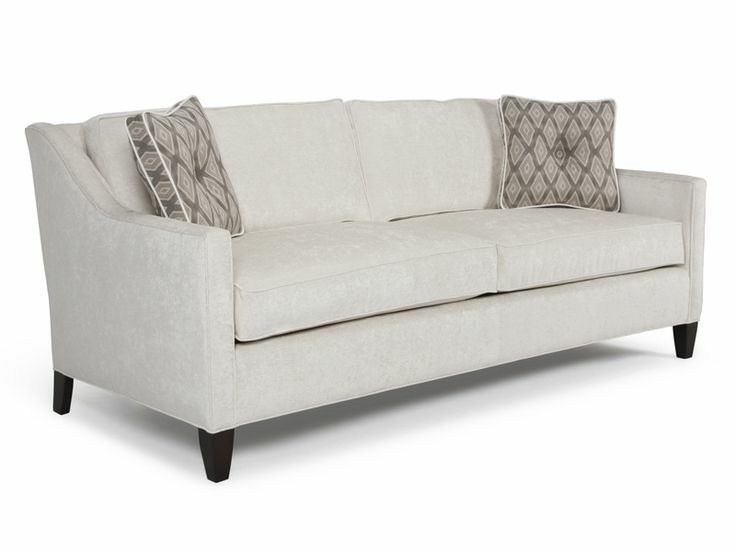 First, we picked out a compact version of this sofa. It'll seat three people if they like each other enough - otherwise two, and usually just me, stretched out and knitting in front of a movie. If only the upholstery options had been more inspiring. We ended up picking a blah beige similar to what's shown here, because I had been imagining undyed linen. Sadly, undyed linen was deemed too fragile for our sofa and frankly, when you're looking at a rough polyester blend, the colour effect is pretty much lost. Then it was off to the store we usually go to, where I'd seen a super compact but supremely comfortable armchair last winter. It was still there! and still comfortable! and just enough different from the sofa not to look matchy! But it had a super wild print. Well, what's not to love about a wild print with all those great colours in it? The fact that the ovals are velveteen, mainly. I knew we'd kill that stuff inside of a year, so we opted for plain red woven upholstery for the two we ordered. It would be great, I think, if the sofa was red and the chairs in beige, but - erm. Big piece in bland, and little pieces in bright? At least I could throw red pillows onto the beige sofa, for much-needed balance. I can live with this combo. But... then it was back to the custom store to finish our order. We were choosing the new, compact dining set there too, and we were starting to feel more and more blah about the beige upholstery. Also, we hadn't added the daybed I really, really want for my office. The daybed is the only thing I wanted for the house that I'm actually getting, so it is pretty important. See how squishy the seat cushion looks? Like it would be sort of heaven to crash out on? It's even better in person. soooo happy. The wood pieces are me trying to choose the leg colour. I have no idea what I picked - probably the darker one? Anyway: picture it. Gorgeous weathered navy velvet sofa on one side of an 11' x 11' space, and two bright cherry armchairs on the other, a very pale maple floor underneath, and white built-in bookshelves all around them. The next day I went back to the chair store and switched the bright red to a stone colour that matches the brocade fabric, and called the sofa store to buy more of the brocade so I can sew some tone-it-down cushions. I mean: contrast is everything, but screaming is not really what I was after in my nice sunshiney living room, you know? What I was going for was English Country Cottage. Proportion: so much more important than I think it is. I'll tell you something about these chairs - they are comfortable. I mean, CRAZY comfortable . The rounded back just hugs you and makes you want to stay sitting, and the seats have a triple layer of squish so they're very easy to relax into. They are so great, we decided to use them as backup for the living room. As it is, we can seat four people in there - but if we bring in a couple of these dining chairs, it'll be six. And to save a little on costs we bought a bench, too - you can see one in the background there, just to the left of the upper part of the chair back - to use for extra seating at the dining room table or in the living room, or even to serve as a coffee table. Can you say, knitting party? With me in a dining chair, using my spinning wheel? Hurray! In the end what we've got for base colours is warm brown, rich deep blue, stone, and gold. And insane amounts of white, obviously. I think this is going to balance a lot better don't you? Okay, onward and upward - have a great day and I'll see you tomorrow. I love your color choices, I hate to pick out new furniture, I'm on the lookout for a super comfy chair. I have a "nice" chair that is okay, I just can't be comfortable if I'm there for over an hour. The arms are just too low which means my knitting is in my lap more than I would like. The couch is out as I have never been comfortable with my sister's choice with it and the recliner. I cannot wait to see the "new" house, I hope it is everything and more than you have dreamed. Laurinda, I would have been all over that first chair in a heartbeat and done a red sofa to match if we weren't so cramped. But I am happy with what we got - I think interior decor is like fashion, you have to go with what works for you at the moment, not what the trends are! And we had such limited sofa upholstery choice, arg.